Convincing kids to try new foods or eat more fruits and veggies can be a struggle, but a new study suggests there’s a way to get preschoolers to eat healthier -- and it doesn’t involve bargaining or pleading. Simply making mealtimes a positive experience can prompt little ones to make healthier food choices, according to a study from the University of Illinois. 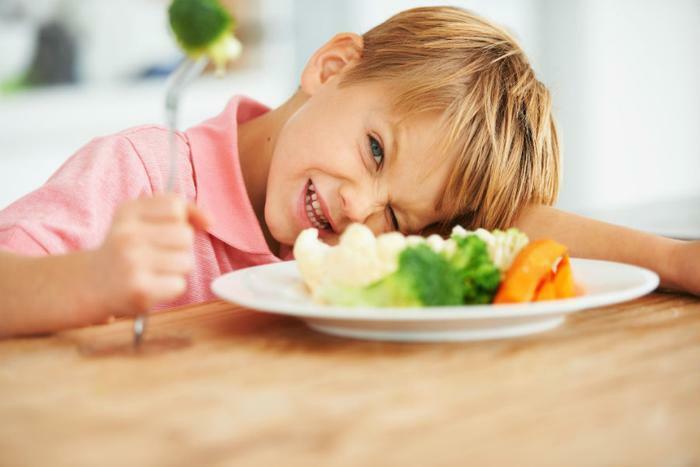 Researchers say a happier emotional climate during meals allows kids to become more receptive to the idea of trying healthy fare they may not have tried before. For the study, 74 parents of preschool-aged children answered two questionnaires about mealtimes over the course of two years. The researchers also conducted a home visit to observe the family’s mealtime behavior, looking closely at the positive and negative emotions expressed by both parents and their children. Ultimately, it was discovered that a more pleasant mealtime atmosphere had a positive effect on what children ate. Children whose families expressed more positive emotions at mealtime ate about one serving more of healthy food (fruits, vegetables, and soy-protein products). "Having more positive mealtimes, where people are enjoying themselves, where there's mutual warmth and engagement, makes it a little bit easier for children to approach healthy foods," said lead author Jaclyn Saltzman, a doctoral candidate in the department of human development and family studies at the University of Illinois. On the other hand, the researchers found that negative emotions tended to put a damper on kids’ willingness to try new things. "When you have a negative family mealtime, you don't want to sit there and try a new thing, enjoy a new texture, or cajole your child into trying something new. You just want to get through it," Saltzman explained. But what if parents aren’t in the mood to put on a happy face at mealtime? There are still a few ways to generate positive emotions, say the study authors. "First of all, I wouldn't tell parents to just be more positive, to just slap a smile on your face, because in the face of a picky-eating preschooler or any other mealtime challenge, that's just not going to work," Saltzman said. "But there are several things parents can do." Be clear about expectations. Make sure your kids know what is expected during meals by engaging in clear and direct communication about what is and isn’t appropriate mealtime behavior. Don’t force food introductions. While establishing healthy eating behaviors early on can pave the way for healthy eating habits later in life, Saltzman says parents shouldn’t force it. Encourage your kids to try new foods, but know that if they still don’t like it after several exposures it may be time to move on. Remind kids to use their words. Screaming doesn’t exactly lend itself to a positive mealtime atmosphere. Encourage your children to express themselves with words rather than screaming when they are upset. Stay calm. Breathing exercises, like mentally counting to 10, can help moms and dads keep their own emotions in check. Establish a routine. Parents should try to have meals in the same place and at the same time each day (when possible) to establish a routine. Get kids involved. Give children age-appropriate jobs, such as having an elementary-aged child set the table. The study also found that having kids participate in the meal planning and preparation process translated to more positive emotions during meals.